Using Intel Core technology processors, the PICO880 is a compact, high performance device. 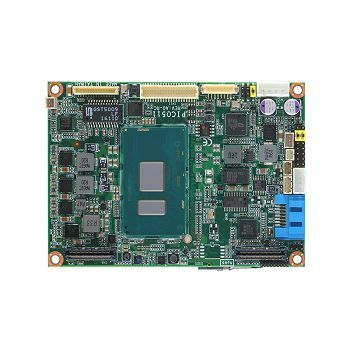 The 2.5-inch form factor PICO board has an operating temperature range of -20 °C to + 70 °C (- 4 °F to +158 °F) and can be fitted with Intel® Core™ i3, i5 or i7 processors and up to 8 GB of RAM. Running on 12 V DC, the computer has a full-size PCI Express Mini Card slot. It features Gigabit Ethernet connectivity - 10/100/1000 Mbps port that supports Wake-on-LAN, RPL/PXE Boot ROM with Intel® i218LM. The board offers rich I/Os with four USB 3.0 ports, four USB 2.0 ports, and one SATA-600. 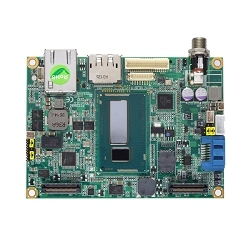 Its display capabilities include one LVDS with 18/24-bit single/dual channel and one DisplayPort. Its onboard connectivity and expansion capabilities through two board-to-board connectors make it ideally suited as a vehicle computer.